Achieving stability in crypto: the trade offs are currently decentralisation, stability and scalability. Stablecoins are an incredibly exciting area of crypto. We are seeing a lot of innovation happening in this area. Stablecoins are crypto assets pegged to the price of another (stable) asset like US Dollar (USD) or Gold. Stablecoins are a primitive, a critical building block for mass crypto adoption. Recently, we have seen Circle and Coinbase, Paxos, and Gemini launch regulated stablecoins in the United States. Earlier this year, the algorithmic stablecoin Basis received over US$130 in funding from Bain Capital, Lightspeed Ventures, Stanley Druckenmiller, among others. A few weeks ago, Andreessen Horowitz made a US$10 million investment in MakerDAO. In today’s marketplace, one thing is certain: not all stablecoins are created equal. People are still attempting to create an optimal stablecoin. Fiat backed stablecoins: These are stablecoins backed by fiat in a bank account or escrow account. By far the most successful model so far. Apollo Capital invested in TrustToken, which is backing trueUSD. Crypto backed stablecoins: These tokens are backed by a volatile asset such as Ethereum. The most popular one includes dai/MakerDAO. Apollo Capital is a holder of the Maker token. Others include Australian project Havven and South Korean Terra.money. Algorithmic stablecoins. These use a form of seignorage shares where supply is adjusted to make sure a peg is not broken. Two projects in this category are Basis and Fragments. We think there are a number of factors that should be optimised over to create a successful and sustainable stablecoin, not just stability. 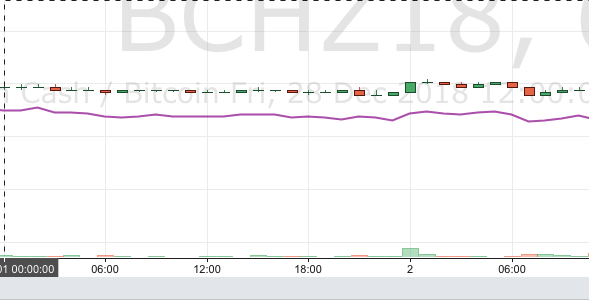 At least as important are decentralisation, scalability and liquidity. Generally, fiat backed stablecoins rate very poorly on decentralisation as they are backed by money in a financial institution controlled by a single entity. It is our view that decentralisation is essential for creating an open financial system. A decentralised stablecoin is permissionless (open to anyone), censorship resistant (transaction finality can be guaranteed) and trustless(we don’t have to trust our funds with a third party). Fiat backed stablecoins will be regulated. 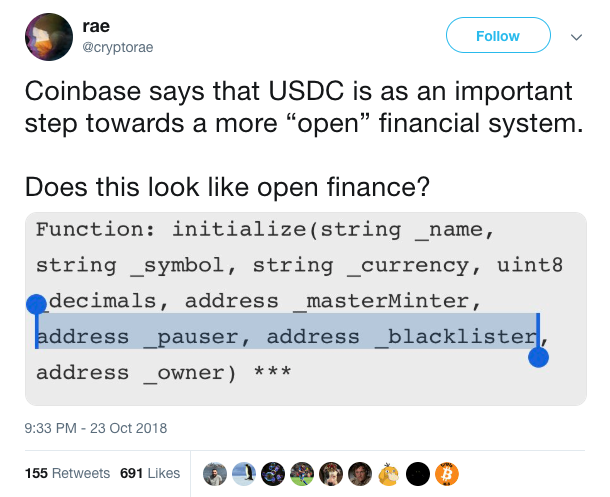 USDC can be blacklisted — it is not decentralized or censorship resistant. The holy grail would be a decentralised, fully backed stablecoin. - If we can create a relatively stable crypto asset, we can increase the crypto ecosystem massively. Many of economic functions that traditional fiat currencies serve, would be able to migrate. - We could do merchant payments in crypto without the need to convert back to fiat; we can lend, borrow, and pay salaries using a stablecoin. - Remittances could be made on the rails of Ethereum, meaning they are fast, cost little, and settle almost instantly. - We see stablecoins is a basic primitive for smart contracts. - ICOs and STOs, our new methods of fundraising, will likely be financed using stablecoins. - Stablecoins are mainly used today as a hedge for traders and investors. - If we have trusted stablecoins, traders may not feel the need to sell back to fiat (and the much slower banking system) during a market correction — and instead stay in the crypto ecosystem. - As a side effect, as when crypto exchanges create more stablecoins pairs, we will likely see more of a differentiated return profile between crypto assets. Much work needs to be done to create an optimal stablecoin, but the race is on. We are seeing an explosion of stablecoins; some that are pegged to the US Dollar (USD), and others to fiat currencies like Australian Dollar (AUD), Japanese Yen (JPY); some to the Consumer Price Index (CPI), and others to Gold. In fact, I’ve been helping Melbourne Mint launch a Gold back stablecoin called Meld (meld.gold). The crypto market is yet again reinventing itself. However, on the eve of the 10 year anniversary of Satoshi’s white paper, let’s recognise the long-term promise of Bitcoin as not only a store of value but a stable medium of exchange — the ultimate stablecoin. Web 3.0 will unleash a new wave of innovation. For entrepreneurs this is great news, anyone can build on top of a platform like Ethereum, that’s the power of a permissionless blockchain. They are not restricted by the terms of services for an app store and they don’t have to give away a substantial part of their revenues to a third party. For the users, the benefits are security (centralised databases sooner or later gets hacked), ownership of data and identity and the freedom to move your data between the coming ecosystem of decentralised apps, or ‘dApps’. Crypto hedge funds love the Fat Protocol hypothesis! The idea is that value is following the data, so when we move to a decentralised world where blockchains are the new protocols for data and value — that is also where most of the value will be captured. We will have a massive ecosystem of application on top of these new protocols, but that’s not where the majority of the value will accrue. We would like to add to this picture by stating that Web 1.0 and Web 2.0 will still be present alongside Web 3.0. Just like we have some mostly static informational web sites today reminiscent of Web 1.0, as we move to a more decentralised web, today’s most popular services will likely still exist. Facebook and Twitter will very likely still be present on the web for a long time still, and they are likely to continue to capture substantial value even in the future. We are indeed perhaps not primarily decentralising the current web. Instead blockchain technology enables a much bigger web through human and machine interactions that simply wasn’t possible before. Not only different but bigger! Digital Ownership. Blockchain technology makes digital ownership possible. Be it of money, data, identity or digital goods. 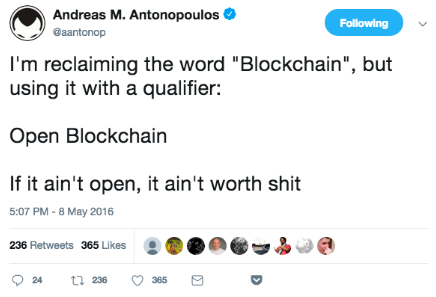 Smart Contracts. With smart contracts an open financial system will be built and available to anyone in the world. Borrowing, lending, derivatives and the democratisation of fund raising. A longer term vision encompasses the rise of decentralised autonomous organisations or ‘DAOs’. Tokenisation of Everything. I’ve previously written on this topic and how real estate, hedge fund and VC interest will be tokenised and then later today’s liquid assets. 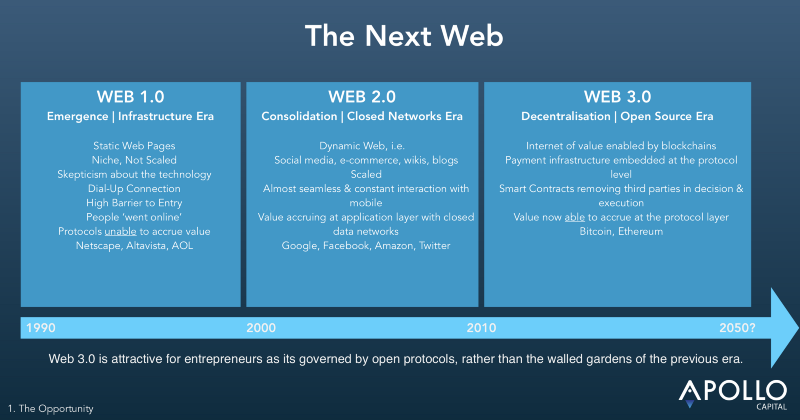 To summarise, Web 3.0 is less about the coming disruption of Facebook, Twitter and Uber and more about enabling new forms of value capture, uniquely enabled by blockchain technology. This is the exciting future we invest in and the reason we are so passionate about our mission at Apollo Capital. DFINITY may well be the most exciting project of 2018. It is a visionary undertaking with an exceptionally talented team. Apollo Capital is proud to have invested alongside a16z Crypto and Polychain Capital. Apollo Capital invested in a $102 million round jointly led by Andreessen Horowitz (via its crypto fund a16z crypto) and Polychain Capital. Both a16z and Polychain were investors in a $61 million round DFINITY announced earlier this year. DFINITY is a decentralised computation network that is able to make digital platforms constructed from trustless, autonomous, and open source software. The ownership and governance of these platforms is controlled by a distributed community of users and developers, rather than companies. Why is having distributed ownership and governance of a computational platform a feature and not a fault? The answer lies in the outsized control that Web 2.0 incumbents have on almost every aspect of their user and developer base. Today’s web platforms like Google, Facebook, and Twitter control each and every interaction between users on the platform, each user’s ability to seamlessly exit and switch to other platforms, applications’ potential for discovery and distribution, all flows of capital, and all relationships between applications and their users. Total control, in other words. A handful of companies dictate the rules of the game. This breeds mistrust and is not sustainable. Today’s centralised platforms have an incentive to extract value from users and developers. This problem has become more acute as the relative power of platforms has increased substantially, locking users into walled gardens that house the network of most value. DFINITY is a scalable and sufficiently decentralised ‘Internet Computer’. A functional internet computer is a fundamental building block to a Web 3.0 economy, which itself relies of the data layer merging with the protocol layer at scale. DFINITY’s distributed computing network allows the creation of smart contracts, perhaps more accurately called verifiable programmable agreements, to run at scale. In doing so, DFINITY may perform a function that today relies on a myriad of organisations, companies, firms, people, and paperwork. A programme that is able to verifiably and trustlessly execute could be used to settle large swathes of the financial economy, for example, to mediate contracts about fundraising, trading, lending, derivatives, payments, to insurance which may be better expressed in code than in legalese. The inherent efficiencies that this kind of internet computer could present to the global economy are too significant to ignore. However, it does rely on an internet computer that can perform at scale — for a user base of billions. This has yet to be achieved. Ethereumin its current state is clogged by simple applications with only hundreds of users. This is because Ethereum is a platform that relies on every miner in the network executing every computation. While this is strong in terms of security and decentralisation, it does not scale. Crypto kitties and FOMO 3D, hardly world changing applications, respectively consumed a large proportion of Ethereum’s network capacity almost rendering it unusable. Ethereum is making headway on the scalability headache with state channels, plasma, and sharding, but the problem still hasn’t been cracked. EOS’ssystem of delegates ensures scalability, but at the cost of decentralisation. By delegating a group of trusted and static actors, the cost of bribing the delegates is likely to be lower than the possible reward, exposing the network to human biases and greed. DFINITY, on the other hand, have devised a compelling solution, that sits somewhere between the currently unscalable but secure Ethereum and the scalable but potentially insecure EOS. It achieves this by randomly selectinga delegation each block. Because it is impossible to know who will be selected, and each block only lasts for 3 seconds, the ability to maliciously influence the network is small. Apollo Capital invests in projects that have the potential to radically reshape the global economy. Permissionless, open, and decentralised blockchains fuelled by a scarce token have the ability to collapse the cost mediation thereby replacing the plethora of middlemen that exist in our economy. Project like DFINITY could scale human collaboration to unprecedented levels by virtue of that collaboration not relying on trust. We are thrilled to have invested in DFINITY and look forward to being a supporting role in this important stage of their journey.